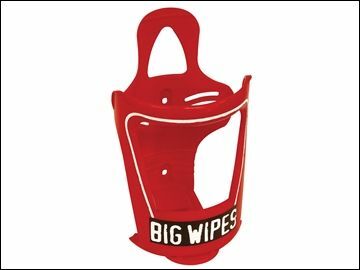 Tub of Red Top Heavy Duty wipes 80+25% inc Van and Wall bracket The Big Wipes Heavy-Duty wipes have a dual-sided high performance fabric for double the cleaning power as the Multi-Purpose Big Wipes, but has the same strength cleaning formula. Big Wipes provide added protection against E.Coli, MRSA, Salmonella, Clostridia, Listeria, Pseudomonas, Enterococcus, Straphylococcus, Aureus and Weils Disease. This tub of 80 Big Wipes comes supplies with th Van & Wall Bracket, this allows one handed dispensing so even the messy jobs can be achieved with ease plus no more looking for your tub of Big Wipes. Push the Big Wipes tub into the bracket, tighten and its ready to dispense. It is both wall and van mountable, It fixes to ply panelling or integrates eaily into a bespoke racking system. Manufactured in robust high quality polycarbonate.